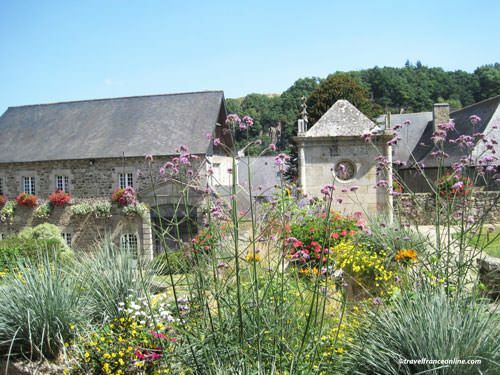 The Abbaye Saint Magloire is nestled in the picturesque medieval village of Léhon near Dinan. Six preacher monks came from Wales in the 6th century AD. They founded the abbey on the bank of the river Rance on land bequeathed to them by Nominoe the king of Britain. Legend has it that they became the custodians of the relics of St-Magloire, the Bishop of Dol de Bretagne, one of seven dioceses of Brittany. The Lords of Dinan generously endowed the Abbaye Saint Magloire de Lehon. However, the Norman invaders destroyed this first abbey during the 9th century, but the monks managed to escape with the Holy Man's relics. The Benedictine monks rebuilt their abbey during the 12th century. The Abbaye Saint Magloire de Lehon is therefore a perfect illustration of transition from Romanesque to Gothic architecture. 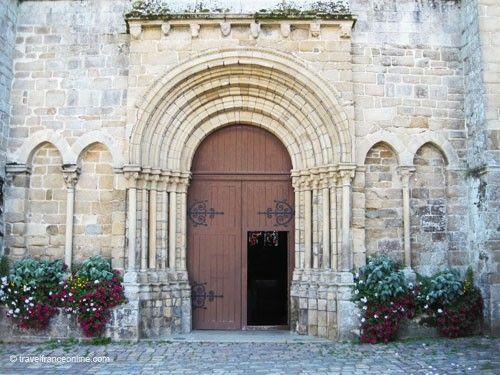 It was indeed rebuilt in the 14th century but the original Romanesque front porch was kept. The abbey thrived until the 15th century when it was placed under the leadership of a commendatory abbot. Mostly secular, these abbots didn't live on the premises nor participated to the day to day running of the abbey. However, they received the income the abbey generated. They kept the major part and redistributed only a minor portion to the monks. This lack of funds obviously generated much discontentment among the monks. It also led to a relaxation of the monastic rule and poor maintenance of the buildings. Fortunately, the abbey underwent a spiritual revival during the 17th century. The newly appointed Prior Noël Mars indeed re-established the Benedictine rule. He also rebuilt the cloisters and monastic buildings around the stunning Romanesque refectory, the abbey's focal point. Unfortunately, the abbey regressed once more after his death. It became dependent from the Abbey of Marmoutiers and therefore lost its prerogatives. As a result, there were only 10 monks left in 1766, when King Louis XV ordered its closure! The last Prior was Etienne de Langle. The French Revolution brought its share of devastation, as the abbey was declared State property. It served as a ammunition depot then was sold to a private owner who set up a tannery in the buildings. Saint Magloire fell slowly into ruins until the 1890s. 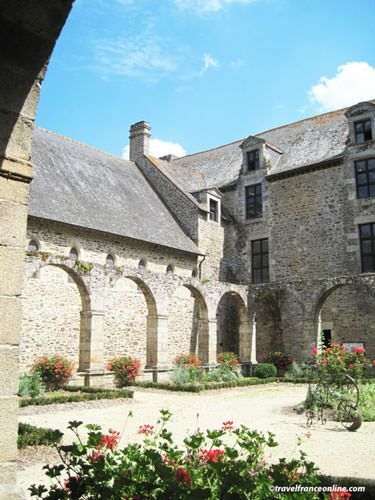 The villagers rehabilitated the buildings with the help of the local abbot and the Frères Hospitaliers de St-Jean de Dieu. They restored the abbey church in order to replace their small parish church. The Abbaye Saint Magloire de Lehon was listed Historical Monument in 1931. A first phase of restoration took place in 1956 in order to isolate the buildings from flooding. The second phase, whicj lasted from 1987 to 1991, focused on the rehabilitation of the church and Romanesque refectory. The third phase of restoration is currently underway. It focuses on the landscaping of the gardens, the rehabilitation of the hospice and the square corner tower that overlooks the gardens and once housed the archives and the prison. The abbey's former bakery, stables and miller's house are today owned privately. Saint Magloire has been the property of the municipality of Léhon since 2001. The village council has since been fully committed to bringing out and promoting this superb building. The church boasts a wealth of architectural features, such as the 12th century original Romanesque porch and granite baptismal font. 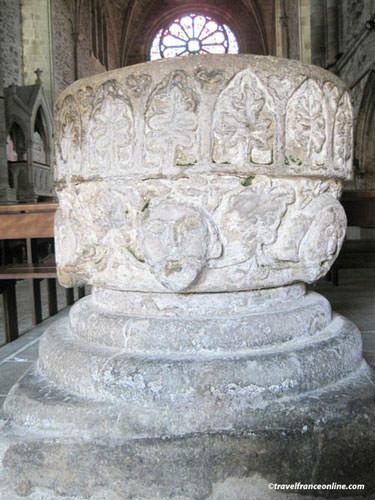 This richly carved font is indeed a superb illustration of Romanesque art. The nave is impressive in size and simplicity. It showcases the ribbed vault which was entirely rebuilt in the late 19th century. In 1962, the Turmel-Dumont workshops created the colourful stained glass windows, as well as the magnificent rose window above the altar. The church indeed badly suffered during WWII when the Germans bombed the bridge. The organ was built in 1997 in order to commemorate the centenary of the restoration of the church. 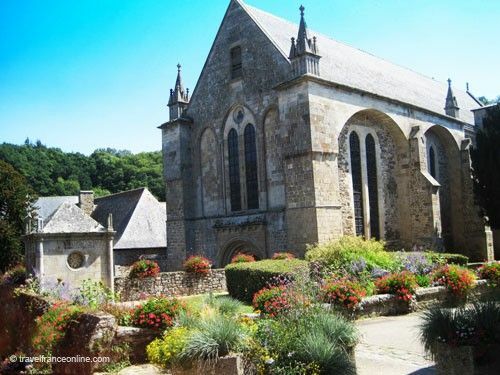 The Beaumanoir family, Lords of Dinan and patrons of the abbey, are buried in the church. Their recumbent statues, which date from the 11th, 12th and 13th centuries, are all placed along the walls of the nave. Among them you'll find some ancestors and descendants of Bertrand du Guesclin, who belonged to a minor branch of the Lords of Dinan. 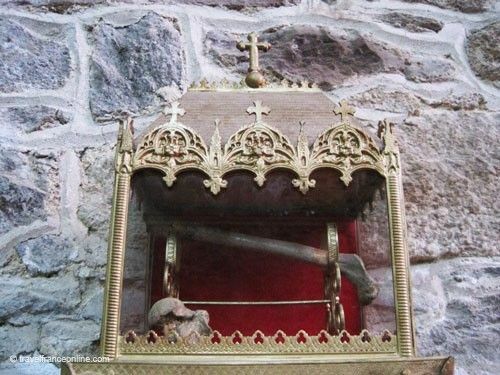 The church exhibits also a bone relic (this is quite rare) in a small gilded shrine affixed on the wall. The cloister was the centre of the monastic life, a place of meditation and contemplation. This cloister is quite recent, as it dates 'only' from the 17th century. However, the wooden frames supporting the roofs of the lateral galleries haven't survived the passage of years. Their absence though brings more light into the small enclosure which has been turned into a venue for temporary art exhibitions. The former Study Room, next to the Chapter House, accommodates a small museum. 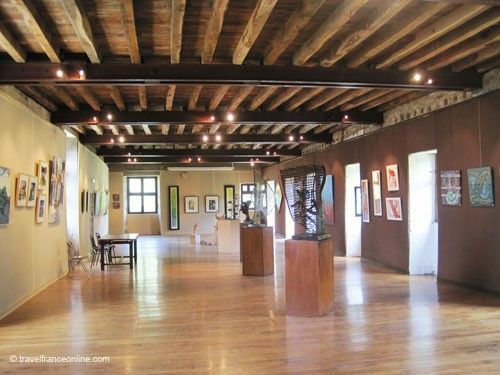 The Musée de l'Abbaye Saint Magloire de Lehon features extensive collections of books, prints and various manuscripts. This room was built during the 17th century above the foundations of the original abbey. Restoration work conducted in 2009 discovered that it had been built above the original 12th century Scriptorium. 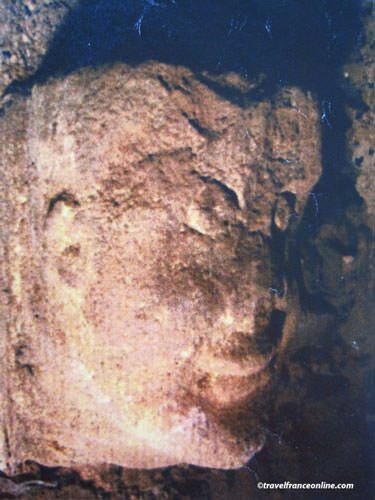 An exceptional sculpted head, since known as Tête Romane – Romanesque Head, was discovered at the same time. The Scriptorium is not open to the public but the Tête Romane is visible through a glass pane affixed on the floor. The Monks Refectory is the only original Romanesque building left. 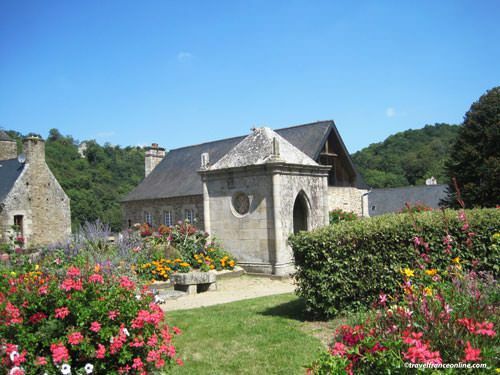 However, it was partially rebuilt in the 17th century in order to adapt it to the requirements of the monastic rule. Practicality took over aesthetics and therefore resulted in a few odd alterations. Firstly, the floor was elevated in order to protect the hall from the river floods. Secondly, new partition walls were built in order to divide space and a library was installed on the top floor. Fortunately, the Monuments Historiques restored it between 1987 and 1991 and recovered its initial volume and floor plan! This restoration included that of the walls' trompe l'oeil decor and the re-paving of the floor with terracotta tiles recovered from a 17th century castle. The restoration work included also the windows. The master glazier Gérard Lardeur created a series of stunning stained-glass windows. They alone are a work of art and their modernity blends perfectly with the hall's Romanesque features. They produce soft bluish-green hues that evolve as the light changes over the course of the day. 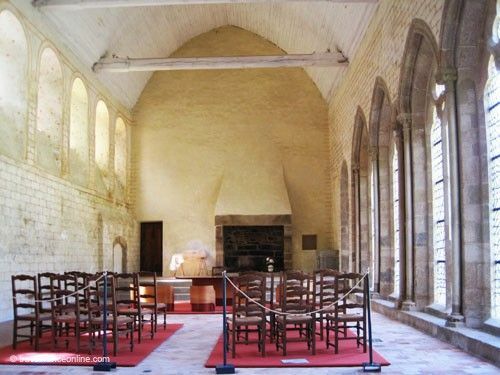 The Village Council has converted the Refectory into a Hall of Honor and uses it for the celebration of civil marriages. A simple yet impressive 17th century wooden staircase leads to the former monks' dormitories. The two halls merged into one and now served for temporary exhibitions..
Partitions and antique furniture have long gone. 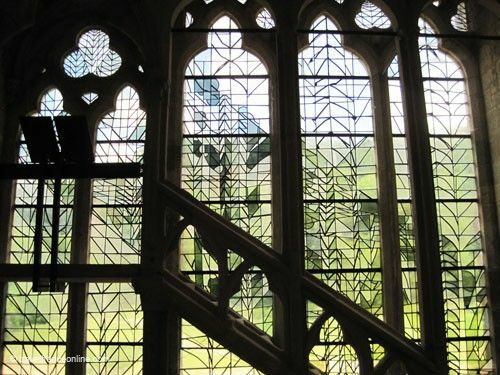 However, the small windows and leaded glass panes are original from the 17th century. A massive stone staircase leads to the attic; it once linked the monks' dormitories to the church. 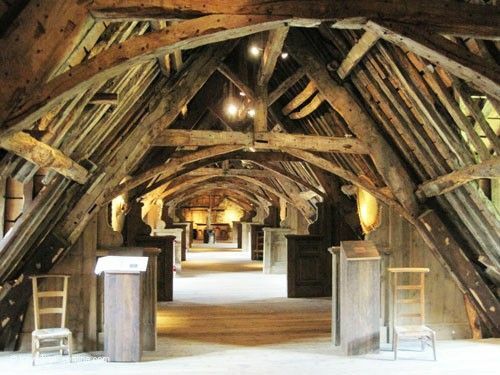 The attic, the abbey's former storage room, boasts impressive volumes as it initially was a single room. The roof wooden frame is shaped like the keel of a boat and gives it a unique character. A series of alcoves were built in 1984 for the shooting of Les Compagnons du Nouveau Monde - Companions of the New World, a film by Gabriel Axel after Bernard Clavel's novel. The gardens stretch down to the river and are dotted with a multitude of Romanesque vestiges recovered from the old abbey. The abbey's two water mills were demolished in the 19th century, but the monks' wine cellar was restored! The three-storey square tower that marks the corner of the main building once housed the abbey's archives. The two upper-floors served also as a prison as the prior had the right to Justice. The conveniences were relegated to the basement! The gardens have retained the monastic quietude and are an excellent spot for relaxing after the visit of the abbey.